The darksaber, a dark lightsaber that was created by Tarre Vizsla, the first Mandalorian ever inducted into the Jedi Order, was an important symbolic weapon. 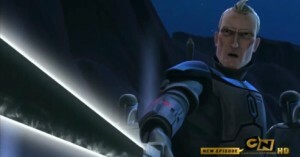 Used by House Vizsla to unify Mandalore, they wielded it in battle and respected by other clans. Ultimately, it came to Pre Vizsla, who wielded it until he dueled Darth Maul, losing the darksaber along with his life. Pre Vizsla and Darth Maul are the only two characters in Star Wars The Clone Wars we see possessing it, until it is dislodged from Darth Maul when is captured by Darth Sidious. Following Darth Maul’s being freed from prison, we see it returned to him and his wielding it for the rest of the Clone Wars. The next time it appears is in Maul’s memorabilia cave on Dathomir, where Sabine Wren takes it. We see her using it against Fenn Rau and continuing to use it into the fourth season of Star Wars Rebels.